“Integrated care,” “primary care integration,” “behavioral health integration.” There is a plethora of buzz terms that essentially mean the same thing: providing mental health treatment in a primary care setting. This concept has been a hot topic in health care over the last several years. There are many reasons why primary care providers are encouraged to adopt integrated care practices and models. Reasons range from cost savings in value-based contracting to population health management to addressing the nationwide shortage of psychiatrists. When you hear the phrase integrated care, you probably think about a behavioral health clinician embedded in a primary care office. But, that’s not the only form of integrated care. Like all of health care, integration occurs on a continuum. The U.S. Substance Abuse and Mental Health Services Administration (SAMHSA) created a continuum of integration from Coordinated, to Co-located, to Integrated. Within these categories are 6 levels of integration, as shown in the table (Heath B. (et al.) A Review and Proposed Standard Framework for Levels of Integrated Healthcare. Washington, D.C. SAMHSA-HRSA Center for Integrated Health Solutions. March 2013). It would be clinically ideal if every practice were able to achieve a level 6 on the integration continuum and be fully integrated with behavioral health services on site. This, however, is not possible for every practice and ultimately not necessary to provide good quality integrated care. Let’s take a closer look at 3 common scenarios that occur on the 6 levels of integration. Level 2: Basic Coordination at a Distance: This is probably the most common form of behavioral health integration that you will find in today’s health care landscape. This level of integration demonstrates collaboration between a primary care provider and specialty behavioral health provider, often through verbal agreements or, in some cases, through a Memorandum of Understanding (MOU) that outlines the expectations of each provider and how they will share information on shared patients. This often includes both providers identifying what clinical information they would like to receive from the other provider and when they would like to receive this information. 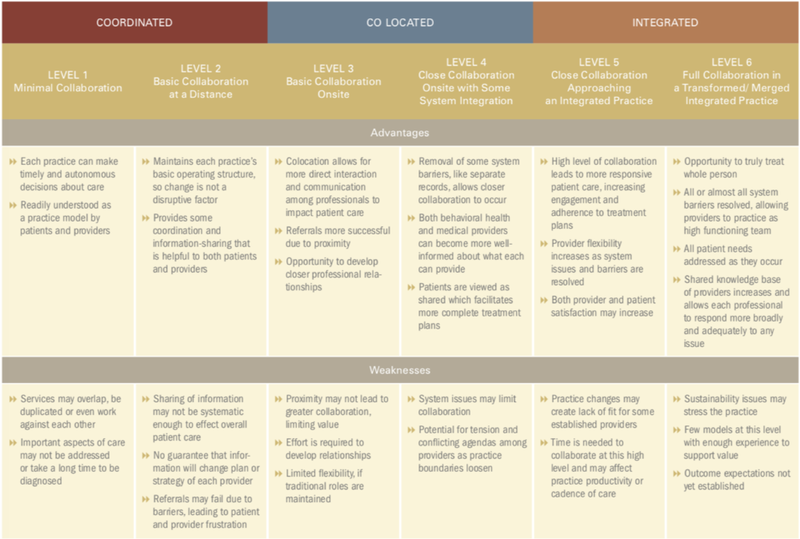 Level 3: Basic Collaboration on Site: This level of integration describes your basic co-location model of behavioral health integration. In this scenario, the primary care provider is providing a behavioral health clinician (BHC) space within their practice to provide mental health treatment to their patients; the BHC is not an employee of the practice. There are often no real established workflows or shared documentation that occurs between the BHC and the physician. However, there are things that can be done to increase collaboration and interaction between the BHC and physician (i.e. identifying shared treatment plans, workflows for warm hand-off, BHC participation in practice Huddles etc.). Level 6: Full Collaboration in a Transformed/Merged Integrated Practice: A practice that has reached this level of integration is more than likely implementing one of the evidenced based models of behavioral health integration such as, Primary Care Behavioral Health (PCBH) a model in which the primary care practice employs BHC/s to provide mental health and substance abuse counseling services to their patients. In this model, the BHC documents in the practice’s electronic medical record and is seen as a key part of the clinical team. Another well-known, evidenced-based model of this level of integration is the Collaborative Care Model. Collaborative Care Model (CoCM) is more targeted in its scope, with the BHC often focusing only on certain behavioral health conditions (i.e. depression, anxiety). The CoCM model harnesses not only BHC’s but also psychiatric consultation, which provides guidance to the primary care physician on medication management, as well as changes in treatment plans if the patient fails to respond to current treatment. If you are interested in learning more about this model, Dr. Art Kelley, Emtiro’s Chief Medical Officer, has written an article on Collaborative Care that can be found here "Bringing Psychiatric Services to Primary Care with the Collaborative Care Model"
Historically, primary care providers have been reluctant to treat mental health disorders in the primary care setting due to a lack of formalized training in psychiatric conditions. Fortunately, payers, regulators and accrediting bodies are beginning to take an interest in integrated care models and, in some cases, are incentivizing providers to implement processes that will move them further along the continuum of integration. NCQA’s coveted Patient Centered Medical Home Recognition is one example of an initiative that encourages providers to introduce integration into their workflows and quality improvement programs. Forward-thinking primary care providers are beginning to have conversations with staff and peers about how their practice will adapt to the growing need for behavioral health integration. When primary care practices address the mental health and substance use disorder (SUD) needs of their patients through integration, benefits accrue to both the provider and the patients. In a recent study consisting of 15 senior physicians and 78 residents results showed that 97.4% of the physicians were satisfied with having an integrated psychologist, 90.1% reported having the behavioral health clinician integrated reduced their stress and 80.9% felt that it improved their patients’ care. (Miller-Matero, L.R. (et al.) (2016) Benefits of integrated behavioral health services: The physician perspective. Families, Systems, & Health, Vol 34(1), Mar 2016, 51-55). Behavioral health integration also provides benefits to patients. Patients who can be effectively treated in their primary care setting have shown increased patient satisfaction scores. Also patients are often times more comfortable in their primary care setting and avoid the potential stigma of being seen walking into the local mental health agency. Patients have better health outcomes when their behavioral health conditions are addressed. A studyconducted by Rebecca C.Rossom, M.D., (et al.) showed better health outcomes in patients with depression and co morbid cardiovascular disease and diabetes and increased patient satisfaction. While there is clear evidence of the need for and benefits of integration, it is something that requires a careful approach, as it is a significant change. There must be a whole-practice change. Changes in practice made solely at the upper administrative level or by the lead physician of the practice can create problems. Top-down implementation strategies to integration can lead to workflow issues that the administrator or lead physician do not foresee and may reduce the level of buy-in from other staff in the practice. Practice-wide conversations and planning around current practice and desired improvements in integration are vital. Another potential pitfall of integration if not done carefully is trying to do too much too quickly. This can lead to frustration and derail the integration efforts. For example, a practice that is not routinely screening for mental health diagnoses is probably not ready to bring on an embedded behavioral health clinician. This practice might want to start with identifying mental health disorders they would like to start screening for and develop systematic workflows around the screening process for those conditions. Completing the MeHAF self-assessment tool provides an excellent way for a practice to avoid major pitfalls as it moves toward full behavioral health integration. Developed by the Maine Health Access Foundation this assessment is designed to guide a practice through consideration of multiple aspects of behavioral health integration. The MeHAF engages everyone in the practice, from front office staff to providers. The inclusion of all staff helps capture a more realistic and complete picture of what is truly happening in the practiceand can be used to create a path to integration. Our trained staff effectively administer the MeHAF and work with the practice to develop and implement a behavioral health integration plan that will achieve the practice goals in a sustainable way. Once goals are identified and the plan is developed, Emtiro Health provides ongoing technical assistance to your practice to ensure progress remains on track and goals are met successfully. “Integrated care," “primary care integration," “behavioral health integration” - whatever you choose to call it - will soon be a new reality for primary care providers. Emtiro Health is ready to assist you in starting the conversation and helping you achieve integration goals that make the most sense for your practice.